It can be really hard to hold onto a special bottle of wine for awhile. We made it three years with this one, having purchased it in 2007 on our one and only trip to Ehlers Estate. The experience can be summed up in one word: "Wow"! This was set aside as a special occasion wine, so we made a special occasion by heading out to Donovan's Steak and Chop House for dinner. Donovan's features great steaks and terrific service. They also make a mean veal chop, so I was guaranteed to be happy. The Ehlers Estate 1886 Cabernet Sauvignon is special for two reasons. First, part of the proceeds are donated to cardiovascular research. The other reason is the taste. 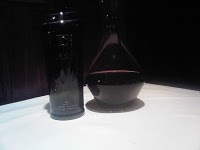 It had a lot of concentrated dark fruit on the mouth, predominantly black cherry, with a little earthiness and a hint of tobacco. The finish had a lot of tannins, the kind that coat your mouth and wash down the food perfectly. It was a great compliment to our steaks! Posted on July 26, 2010 by Jeff & Sally Toister and filed under Wine Discoveries and tagged Cabernet Sauvignon.